Jane Powell and Fred Astaire in a publicity still for Royal Wedding (1951). 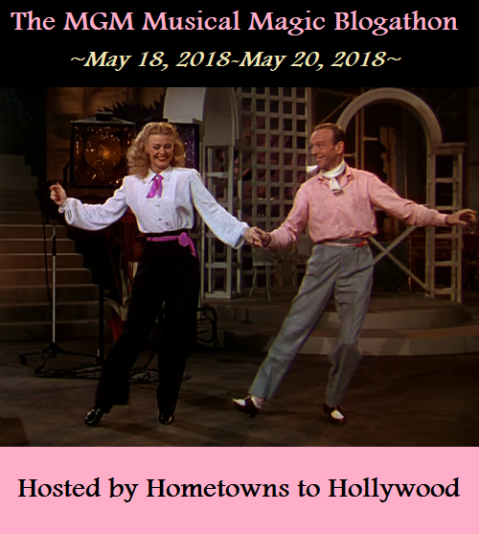 This article is part of The MGM Musical Magic Blogathon hosted by Hometowns to Hollywood. If you can't enough of the nuptials of the United Kingdom's Prince Harry and American actor Meghan Markle, why not celebrate the happy event by watching Royal Wedding (1951). Even if you aren't interested in royalty, this MGM musical starring Fred Astaire and Jane Powell and directed by Stanley Donen is a joyous experience with a plot that surrounds the 1947 wedding of Queen Elizabeth II and Prince Philip. Royal Wedding begins when siblings and musical stars Tom and Ellen Bowen (Astaire and Powell) transfer their hit Broadway show to London's West End. While on the boat to England, Ellen meets and falls for a handsome but penniless aristocrat (Peter Lawford), while Tom becomes enamored with a lovely dancer (Sarah Churchill) who auditions for his show. Royal Wedding started out as a musical about the famous honeymoon destination Niagara Falls, but after running into copyright issues -- apparently Hal Roach owned the rights to the title Niagara Falls--MGM producer Arthur Freed changed the location to London and set the story around the 1947 wedding of Princess Elizabeth to Naval officer Philip Mountbatten. The script was also changed to reflect Astaire's life story. He and his sister, Adele, were a hugely popular song and dance team until she married an English aristocrat, Lord Charles Cavendish, in 1932. 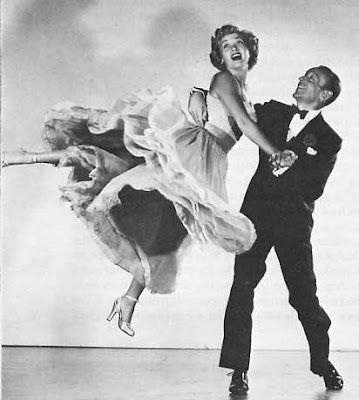 Jane Powell and Fred Astaire in the "Ev'ry Night at Seven" number in Royal Wedding (1950). Freed had a much easier time casting the two love interests: he went with MGM matinee idol Lawford for Ellen's beau and Churchill for Tom's lady love. Churchill was the daughter of British Prime Minister Winston Churchill, although MGM's publicity department was rather strangely forbidden to mention that fact, according to the American Film Institute notes. (If all of the above isn't enough to make your head spin, director Charles Walters, who was unhappy with Garland's casting in the film, was replaced by On the Town (1949) veteran Donen during pre-production). Royal Wedding isn't one of the great MGM musicals like Meet Me in St. Louis (1944) and Singin' in the Rain (1952), but it is a lot of fun to watch. There's Keenan Wynn in a double role as a fast-talking New-York agent and very proper Brit and several wonderful songs from Burton Lane and Alan Jay Lerner. The most talked about production numbers are Astaire's two solo efforts, "Sunday Jumps" and "You're All the World to Me." In the first number, Astaire memorably dances with a coat rack and other objects in the ship's gym (this was later turned into a Dirt Devil commercial). The number everyone remembers from Royal Wedding is of course Astaire's dance on the ceiling, which was achieved by building a special rotating room with the furniture and camera bolted to the floor. However, for me, Royal Wedding's real revelation is Powell. Many people are familiar with her spunky screen presence and beautiful voice because of Seven Brides for Seven Brothers (1954), but she really takes it to the next level in Royal Wedding. She matches Astaire step-for-step in the ballroom dancing number "Open Your Eyes," and she has a scorching solo dance in the otherwise silly, "I Left My Hat in Haiti." However, what really puts her in the first rank of Astaire's costars is the comic song, "How Could You Believe Me When I Said I Loved You When You Know I've Been a Liar All My Life" (clip above). Powell is all Brooklyn accent, sassy attitude, and killer tap-dancing moves; in fact, she makes a bigger impression than Astaire although he has the more complicated dance steps. Finally, Royal Wedding provides glimpses into the wedding of Elizabeth and Philip, who were wed Nov. 20, 1947, in Westminster Abbey in London (there is actual newsreel footage of the wedding procession in the movie, but only long shots because closeups of the royal family in a Hollywood movie were thought to be disrespectful at that time) The couple's elaborate nuptials were the first really lavish event after the hard times of World War II and hundreds of thousands turned out on the streets of the UK capital to watch the historic event (clip below). Elizabeth, 92, and Philip, 96, celebrated their 70th wedding anniversary last year, and they attended their grandson Harry's nuptials on Saturday. I'll leave you with this newsreel clip about Elizabeth and Philip's wedding. Royal Wedding is airing at 10 am June 19 on TCM. It is also available for streaming on Amazon Prime and Fandor and on DVD. Jane Powell absolutely makes Royal Wedding for me. Singing Too Late Now, dancing with Fred in those great numbers. I'm so glad things worked out for her to play this role. This is a late-night-to-cheer-you movie for me. It has always blown my mind that June Allyson was originally cast in Royal Wedding. Not only do I not think she would have been nearly as good as Jane Powell in the role, but I can't picture anyone but Jane in the part! And she and Fred Astaire are so great as siblings. Okay, obviously Fred is way too old to be her brother, but the movie is so much fun and so enjoyable that I am more than willing to suspend my disbelief. I really do wish Jane Powell had made more movies! Me too! Powell is an absolute revelation in Royal Wedding. Probably, if her career had started a few years earlier, she would have been a major musical star in Hollywood. Thanks so much for participating in the MGM Musical Magic Blogathon! I had no idea that June was originally slated for a role in this musical! Super interesting. This musical is one of my favorites because the cast is wonderful and the musical numbers are such fun. I definitely watching this movie immediately after Will and Kate's wedding, lol. Thanks again!